We believe creating shared value between MTI and our community and customers is what furthers our innovation and progress. Your encouragement, curiosity, and questioning drives our work just as much as our resulting technology enables your research. It is this feedback cycle that propels progress, betterment, and ultimately, sustainability for the resources we all aim to protect and the work that we all do. To acknowledge our appreciation and understanding of the work still to do, we strongly believe in using our skills to give back to the community we serve. We treasure opportunities to work with local organizations, support our fellow researchers, and provide hands-on learning experiences for students across the globe. 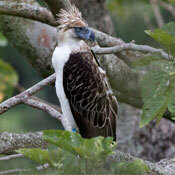 Now and then, we invite our customers to share with us the exciting photographs they capture while out in the field. Prizes for the winning pictures have included free transmitters, free refurbishments, free Yagi antennas, and more! 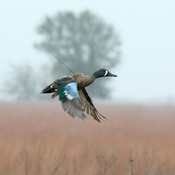 2016 — Andy Ramey and Jayson Ibanez both took first place — Andy for his submission of Blue-winged Teal with a Solar 9.5g PTT (photographed by Jonas Bonnedahl), and Jayson for a photo of a Philippine Eagle tagged with GPS/GSM 20-70 70g Transmitter (photographed by John McKean). 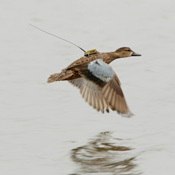 2013 — Manuel Grosselet and Georgita Ruiz were awarded first prize for their photo of a male Blue-winged Teal tagged with a Solar 9.5g PTT. 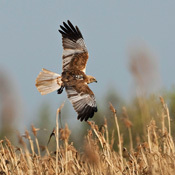 2010 — Patrik Olofsson won first prize in the Avian category for his picture of a harrier tagged with a Solar Argos/GPS 30g PTT. 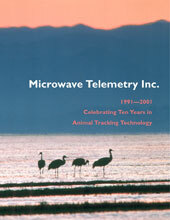 2001 — We awarded a Solar Argos/GPS 70g PTT to Claire Mirande and Kate Fitzwilliams of the International Crane Foundation for their submission depicting Black-neck Cranes in a silhouette against a sunset in Caottai, China. This beautiful image, taken by George Archibald, was used for the cover photo of our 10th anniversary catalog (at right). 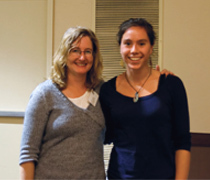 At our 2012 Avian and Marine Tracking Conference, we held a surprise drawing and awarded a bird and a fish transmitter to Lisa Davenport and Lela Schlenker, respectively (shown at left). In 2001, we gifted a Solar 18g PTT to Peter Nye of the New York State Department of Environmental Conservation and a Solar Argos/GPS 70g PTT to Claire Mirande of the International Crane Foundation as part of a lucky draw at the company’s annual holiday party. Read more about these amazing tracks in our 2005 Winter Newsletter.